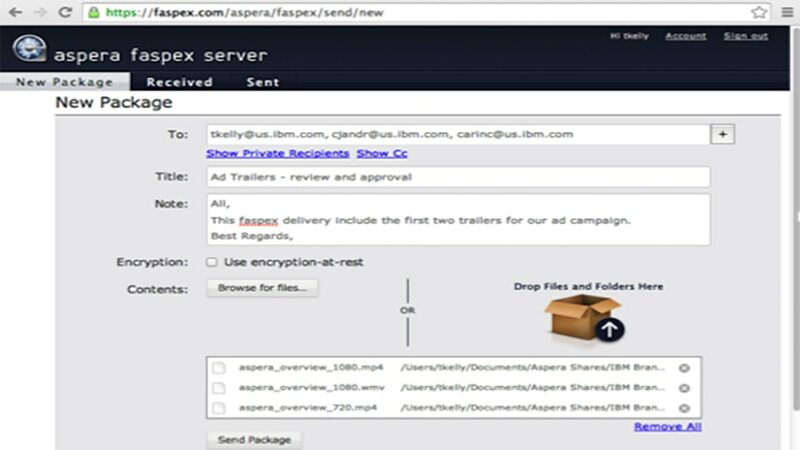 IBM® Aspera® faspex™ is a solution for fast, global person-to-person file delivery and collaboration. Users can send and receive unlimited-size digital packages at high speed among geographically dispersed teams in an email-style workflow using a standard web browser, a desktop application or a mobile app. Automated receipts of digital deliveries from multiple entities save time and hassle and reduce risk of file loss in a manual process. Customize drop boxes with meta data and triggers for automated post-receipt file processing. Custom user registration, including self-registration, for ad-hoc submissions and distributions that do not require a faspex account.